A blackhead is also known as an open comedone. 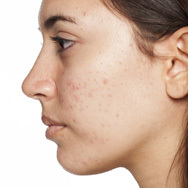 Technically, it’s not acne, but rather a type of clogged pore that can occur on its own or along with acne. Blackheads form when dead skin cells mix with excess oil and debris in the pore lining. Once the oil mix reaches the opening of the pore (at skin’s surface), it oxidises, turning black. Tiny white bumps on skin are another type of clogged pore. They’re sometimes referred to as closed comedones because, unlike blackheads, the head of the white bump is covered by a thin layer of skin, so the contents aren’t exposed to the air so don’t oxidise and turn black.